Scientists from Case Western Reserve University took a sea slug’s mouth muscle and attached it to two-inch 3-D printed parts to make a “biohybrid robot.” When shocked using electricity, the muscle helps the hybrid crawl forward—though at the not-very-quick speed of 0.4 centimeters a minute. “We’re creating a robot that can manage different tasks than an animal or a purely manmade robot could,” said doctoral candidate Victoria Quinn, who is leading the research. Sea slugs are adaptable to different temperatures and the soft muscle cells are safer to operate than hard parts. In the future, these biohybrid robots could be used for search missions in the ocean. 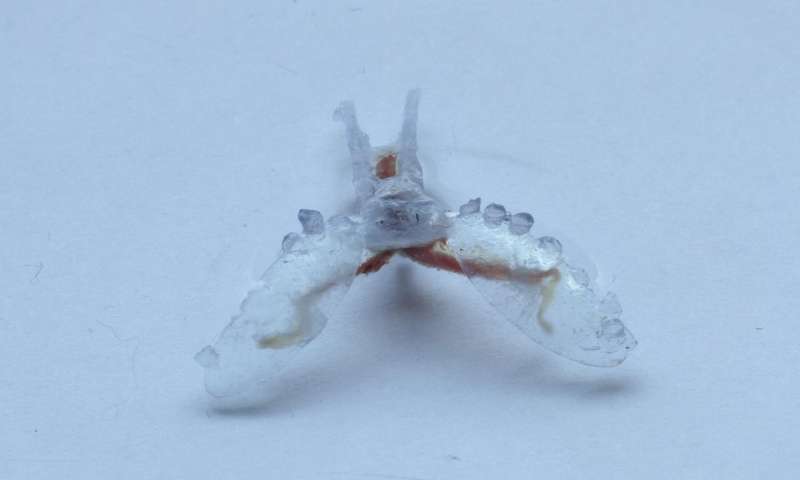 Between this 3-D printed sea slug and the stingray robot fueled from light-activated cells from rat hearts one day we could have an entire fleet of cyborg animals doing our bidding.